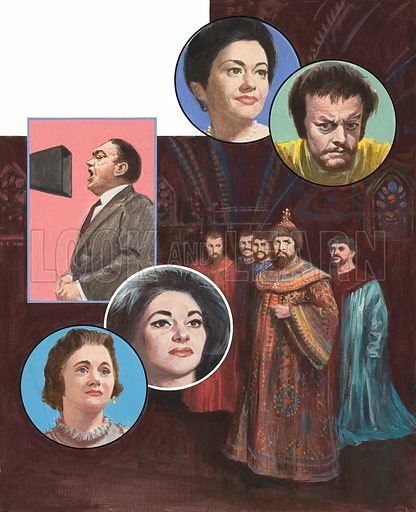 World-famous Opera Singers, including Gwyneth Jones (top left), Tito Gobi (top right), Enrico Caruso (top left with microphone), Joan Sutherland (bottom left), Maria Callas (middle of bottom row), with Feodara Chaliapin, as the Tsar Boris Gudunov. Original artwork for illustration on p15 of Look and Learn issue no 323 (23 March 1968). Available worldwide for immediate download up to 3,606 x 4,437 pixels.